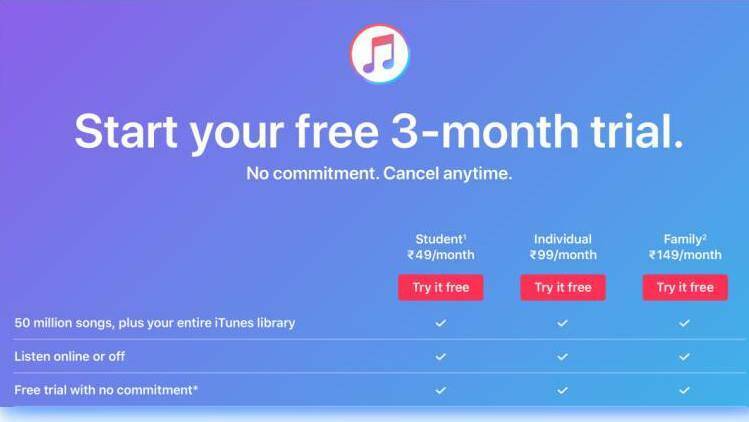 Apple Music's new, cheaper, subscriptions come just weeks after both Spotify and YouTube Music started becoming available in India. Close to four years after it was launched in India, Apple Music has revised its subscription rates in India and made it cheaper to access its large collection from across the world. The new pricing offers the service as a monthly subscription of Rs 99 for individuals and Rs 149 for families. Students now get to stream music as just Rs 49 a month. India is a crucial market for any streaming service aiming to grow its numbers. Powered by the cheapest data services in the world, Indian users have been moving towards streaming services for video and music over the past couple of years. Some have even shown and appetite for paid services where there is some unique content or offline services available as an add on. It needs to be seen if Apple’s move triggers a price war among these services. Apple Music has over 56 million subscribers globally and has been able to expand its base considerably thanks to its availability on Android devices with the same set of features as iOS. This has also been behind Apple Music’s success in India, where traditionally iOS devices have a lower penetration rate. Apple news now has a ‘Browse’ tab with an editorially-curated New Music section. Apple has also been featuring a ‘Pre-adds’ section for subscribers to sign up for a full album ahead of its release. The most popular pre-adds are now featured in the ‘Coming Soon’ section. Curated playlists like A-List and Today’s Hits are now available with Indian content and are quite popular in regional languages like Malayalam and Tamil. Apple Music also offers 14 localised radio stations. It has partnered with all leading music labels in the country, including Saregama, T series, Zee Music, YRF, Universal, Sony Music, to cater to the challenges of a country with as varied music tastes as India.